Former President, Gloria Macapagal Arroyo has been served a warrant of arrest at her hospital bed in St. Luke’s Medical Center in Taguig City on Saturday, November 19 at around 3:30 p.m., for electoral sabotage, which carries a life sentence. Her husband, former first gentleman Jose Miguel “Mike” Arroyo, several family members and friends of the Arroyos were in the room during the Congresswoman's fingerprints and mugshots booking procedure. The booking was facilitated by Philippine National Police-Criminal Investigation and Detection Unit Senior Superintendent Joel Coronel who said that Arroyo's documents will be sent to Camp Crame in Quezon City for processing. He also said the mugshots will be released on the court's discretion. 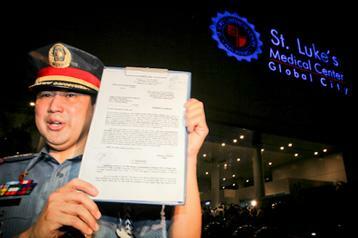 "She's now under hospital arrest," Coronel added. Arrest warrants were also served to Andal Sr. and former election officer Lintang Bedol. On Friday, the Commission on Elections filed electoral sabotage charges at the Pasay City regional trial court against Arroyo, former Maguindanao Gov. Andal Ampatuan Sr., and former election supervisor Lintang Bedol for the alleged massive cheating in the Maguindanao polls in 2007. Based on Republic Act No. 6646, electoral sabotage constitutes altering of votes during an election, tampering numbers on "large scale or in substantial numbers." poor PGMA many people hate her, every move is a detail. "I will never run as president" even if they given me a 100% support for sure winning. i want freedom not imprisonment.